The rain held out and we got in our first time trial event at Harris Lake County Park. The route included the Intermediate and Advanced trails for one hard 6-milish lap. There were 35 fantastic racers! This is the first race where we had 5 kids (< age 12) enter and race. Nothing is cooler than seeing a kid race a mountain bike. We also had 3 juniors and a record setting 8 women competing! Another great part about this race was the number of first timers. I love having new people try racing. Perfect weather, perfect trails and an interesting race format made it a great day. Many thanks to Cycling Spoken Here for being the main sponsor for this race and supporting mountain biking in the Triangle! Crank Arm Brewing also provided sponsorship for this event. The race couldn’t have happened without some great volunteers, I’d like to thank Trina, Ela, Cooper R., John L, Rick E., and Beth for helping run the race. I’d also like to thank Wake County Parks & Rec for allowing us to use the trails for our race and special thanks to Ashley and Joe from Harris Lake County Park. TORC uses the race net money to build and maintain trails and advocate for mountain biking! Join us on June 21st for TORCfest and the Crabtree Time Trial! The prime parking spots will be along Wildwind Drive (see map below). Those probably will go fast! The map (from Google maps) doesn’t show streets in the area highlighted “Overflow Parking” north of Briar Chapel Parkway, but there are several mostly vacant streets with plenty of parking space. Please don’t block someone’s house with your car and obey any parking rules!!! Actual cut-off time to go out for your last lap will be 3:00pm EST. The Bicycle Chain and Clean Machine have donated $100 gift certificates to go out to the best male and female racer (each) at 6BC! To recap: $200 in cash, swag and $100 gift certificate to best male and female solo riders each! All systems are ‘go’ for this Sunday! Looks like we will have great fall weather for race day. No excuse to not be at the 6BC this Sunday!! Here is a map of the actual race loop course. The timing table will be located at the corner of Briar Chapel Parkway and Wildwind Drive (see map). 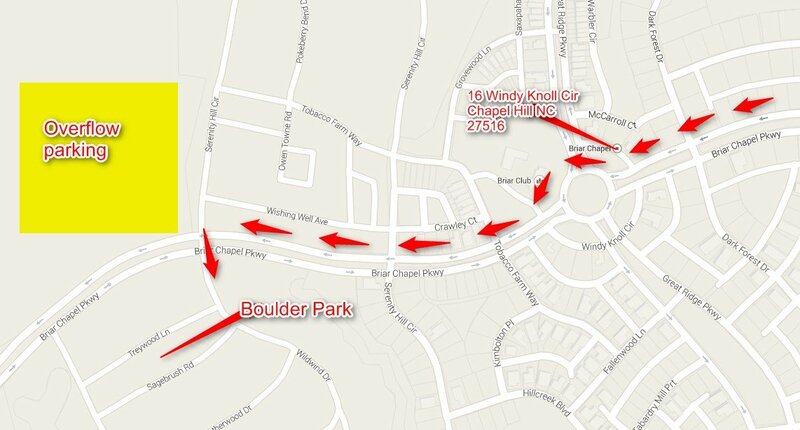 The transition area will be located around the “boulder park” (see map). NOT the same park as previous years. The trail out to Woods Charter School will NOT be part of the race course. Looking forward to a great turn out this Sunday!